This is a foreign exchange guide to Turkmenistan, the Turkmenistani Manat currency plus TMT transfers and travel tips. Turkmenistani Manat exchange rates - latest & historic exchange rates. What is the Turkmenistani Manat currency code and symbol? The three letter currency code for the Turkmenistani Manat is TMT and the symbol is m.
Which countries use the Turkmenistani Manat? It is the domestic currency in Turkmenistan. The interactive chart below shows the USD to TMT exchange rate for the previous 3 months with rate alerts for days when the exchange rate moved up or down significantly or for 30 day highs and lows. How to get around in Turkmenistan. Air transport is well priced and generally reliable, and well worth considering if you're in a hurry. Domestic Turkmenistan Airlines flights are heavily subsidised for locals (although not foreigners). Consequently demand is high and flights need to be booked in advance. Turkmenistan Airlines serves the country's main cities with a fleet of modern Boeing 717s. As the main hub, most flights go in and out of Ashgabat, though there are also flights from Dashoguz to Turkmenbashi, Mary and Turkmenabat; from Mary to Turkmenbashi; and from Turkmenbashi to Turkmenabat. Marshrutkas and minibuses are the most effective way to get around, though they're cramped for long journeys and you'll often have to wait for some time until they're full for them to depart. Shared taxis are a good alternative to marshrutkas, being faster and more comfortable (and you can even buy the remaining seats in a vehicle if you're in a hurry to get going). Buses are a slow but cheap way to get around. The Ministry of Motor Transport lists routes, timetables and fares – all, rather remarkably, in English: http://www.awtomenzil.gov.tm. Driving through Turkmenistan is perfectly possible if you arrive with your own vehicle, but it's expensive and full of hassles (road blocks, poor roads) and extra charges. Significantly, there’s also a road tax calculated by the kilometre for your route through the country. Trains are slow but comfortable and a great way to see the countryside and meet people. Train fares are likely to be charged in US dollars, although some travellers have reported paying in manat. You can expect to pay US$15 to US$20 for a journey of around eight hours. 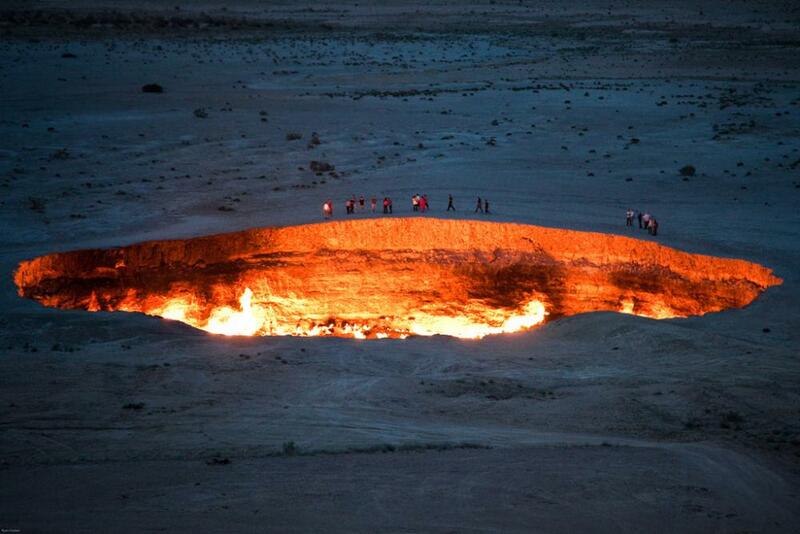 The Door to Hell is also known as the Darvaza crater, named after a nearby village. It originates from the 1971, when Soviet geologists were prospecting for gas. They accidentally hit an underground gas pocket, causing the whole thing to collapse into a deep sinkhole. Fearing that the crater would emit poisonous gases, they had the brilliant idea to set the whole place on fire hoping it would burn out quickly. But here we are, almost half a century later, and the thing is still burning. Not surprisingly, Turkmenistan has the fourth largest gas reserves in the world. When the USSR crumbled in 1991, the five Central Asian states became countries in their own right for the first time, and replaced communism with burgeoning national identities. Turkmenistan soon became known for the bizarre personality cult of the late President Niyazov, who died in 2006, turning the capital Ashgabat into a shrine to himself, including a golden statue that rotated with the sun. Turkmen culture is far more than just Niyazov and his successor, current president Gurbanguly Berdimukhamedov, although there’s plenty of propaganda books you can buy to remember them long after you’ve left. Descendants of nomadic desert tribes, the Turkmen infuse their Islam with animism. You’ll find pilgrims’ shrines dotted all around the country, with locals stopping to worship, leave items for luck, and attend to rituals, like walking around minarets in circles. With such an unusual history, be prepared for a few wild travel moments. The border crossing is an experience in itself, and the guards will almost certainly go through your luggage. In a repressive political climate, it won’t come as much of a surprise that the police can be sensitive about photography, particularly around government buildings in Ashgabat. Save money and time by Ordering your Turkmenistani Manat online from Travelex, you get better rates and can pick up the TMT cash locally or even on travel day at the airport. For card purchases if offered a choice of currencies always select to Pay in Turkmenistani Manat otherwise you may get much worst exchange rates. Compare TMT travel cash rates - probably why you are here! When searching around for information on how to get a good exchange rate when sending money to Turkmenistan you need to start with finding out the latest Turkmenistani Manat foreign-transfer exchange rate. Once your funds are received by the provider the converted TMT amount will be transfered to the recipient account you specify in Turkmenistan. Use our Send to TMT calculator to compare the exchange rates of FX specialist providers rates versus your bank's standard rates you can hopefully save around 5% and maybe more - end result is more Turkmenistani Manat deposited into the recipient bank account and less margins and fees kept by the banks!